Challenge: Promote Advantis higher-rate and rewards checking solutions to members and prospects. Solution: Generate messaging for direct mail and website channels that highlight value propositions for Fusion Checking and Cashback Checking. Top: Fusion Checking mailer front & back. Download this asset. 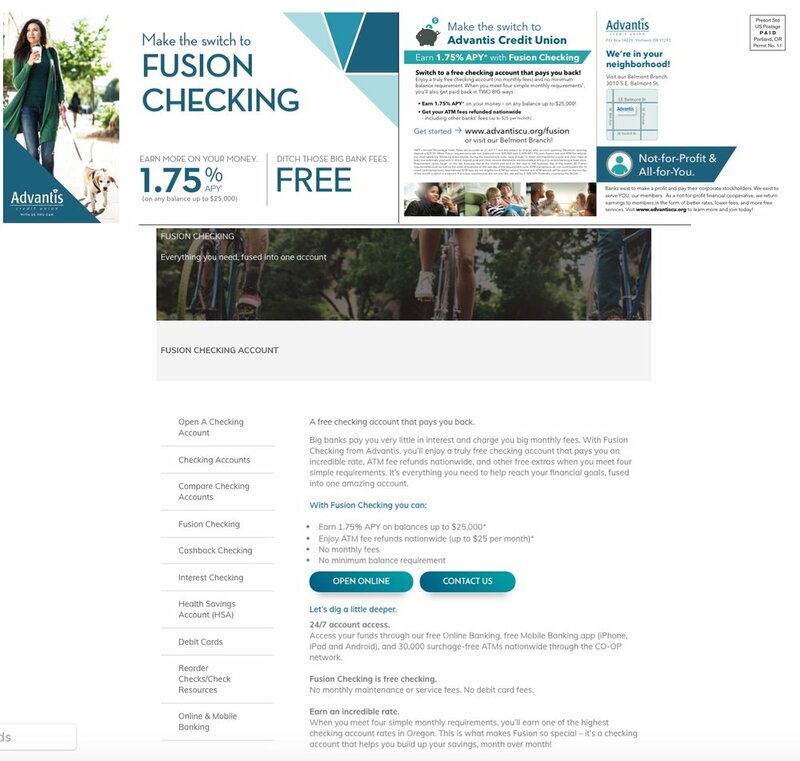 Bottom: Excerpt of Fusion Checking landing page. Download this asset. Top: Cashback Checking mailer front & back. Download this asset. Bottom: Excerpt of Cashback Checking landing page. Download this asset. Challenge: Promote limited-time Advantis mortgage refi and personal loan offers to members and prospects. Solution: Generate messaging for direct mail and website channels that highlight value propositions for 10-15 Year Mortgages and Personal Loan offers. Top: 10- or 15-Year Fixed Mortgage mailer front & back. Download this asset. Middle: Personal Loan statement stuffer. Download this asset. Bottom: Excerpt of Personal Loan Offer landing page. Download this asset. Challenge: Use an interstitial log-in page to drive traffic to preview an unbranded bundle of balance-preview features in Bank of America Online Banking. Solution: Align features bundle with a concept of users "looking into the future" of their finances. Challenge: Use interstitial log-in page format to drive Bank of America Easy Online Payroll service users to upgrade to premium tier. Solution: Lead with a header that links benefit to the upgrade and flesh out details in body copy. Challenge: Use log-in interstitial page to drive targeted Bank of America online customers to enjoy higher limits on funds transfers. Solution: Speak to primary benefit in headline and flesh out details of further benefits in body copy. Challenge: Use email format to promote PayPal's initial debit card offering to consumers. Solution: Use header and subject line to highlight primary cashback benefit and body copy to detail further benefits.